Afternoon everyone, well this week's challenge over at Less is More is the theme of FRIENDSHIP. I decided to go with a digi stamp of children that I've had for ages. It's an illustration by Susan Beatrice Pearse and I used my new Chameleon pens that Karen bought me for my birthday and Christmas, to colour it in! The base card is embossed using an Imagination stencil and lightly dusted with Spun Sugar DI. I cut out the image with a scalloped die and dusted that with the same ink. The sentiment is an old SeeDee one cut out using a matching smaller die and a pearl added. I'm also linking my card to the latest challenge over at Uniko Studio which is Love and Friendship. It was a friend's birthday on Tuesday and I don't have a very good photo of her card but thought I'd share it just the same! No blue involved just buff and chocolate using Sue Wilson dies for card shape and flowers and Tonic for the sentiment. 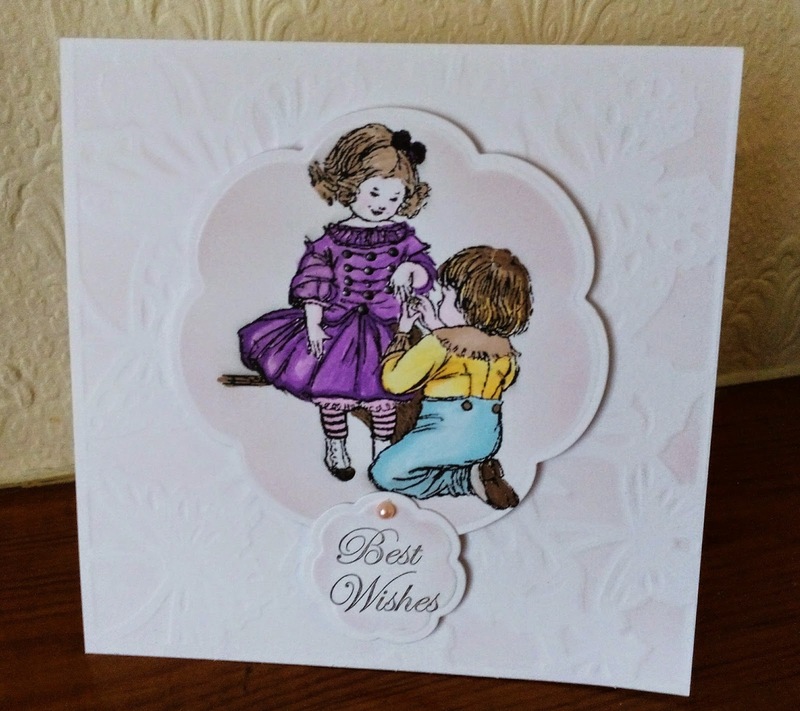 Such a pretty friendship card Val - love the colours you've used and the embossing with the Spun Sugar dusted on top is so pretty. 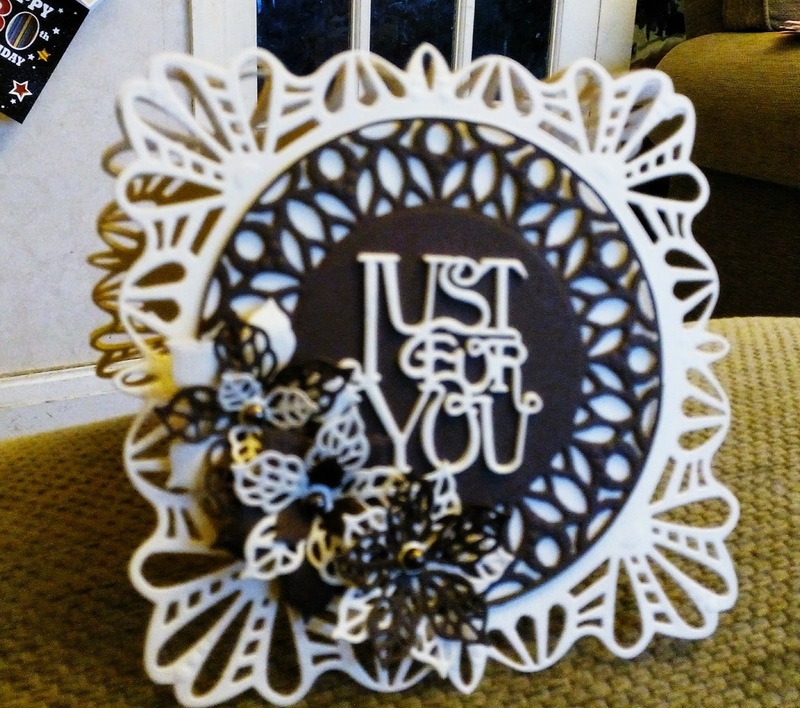 The Just for You card is lovely and really like the buff and chocolate colourway. Congrats on your win at CASE-ing Christmas. aawww... what a sweet card, val... so perfect for the LIM challenge! the second card is just gorgeous!! The friendship card is adorable Val - the image has a lovely vintage look. Love the ornate die-cuts on your friend's card - absolutely fabulous! Congrats on your Christmas win too! Two fantastic card, love the sweet image on the first one. Love that adorable image. The dies for the second card - wow!!! That's a fab card !! Two great cards - the friendship one has a sweet image just right for the challenge and the one made using dies is elegant. congratulations on your win. Beautiful cards Valerie particularly the LIM one and thanks so much for sharing and taking part. You might also like to link up at Uniko Studio where the challenge theme is Love & Friendship. This is a super friendship card Val.. really nostalgic! Val what an adorable image!